Columbus is the oft-forgotten third child when it comes to Ohio cities, but it’s the legitimate best. Don’t come here expecting a big-city feel, though: we’re more of a cute, little city. Columbus has a billion different sections, all of which have their own charm. The city is small enough that, if you’re a walker/cyclist, you can explore it sans-automobile. One of the emerging art districts in the country, Short North is Columbus’ hipster haven (for now. Everyone loves it, so it’s becoming a little mainstream for the hipsters). I live down the road from this ridiculously cute outskirt of the city. This is where the urban center becomes the suburbs, in a way, and it’s filled with good restaurants, boutiques, and businesses that you can spend hours exploring. I’m a picky eater, but these places are more or less unanimously agreed upon as some of the finest establishments in Central Ohio. 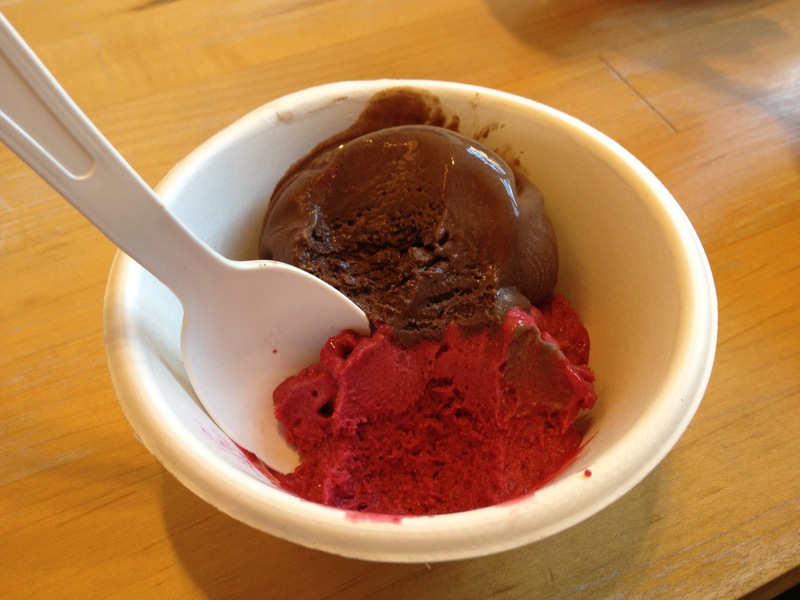 Probably the most well known of Columbus’ products is Jeni’s, also known as the best ice cream on the planet. 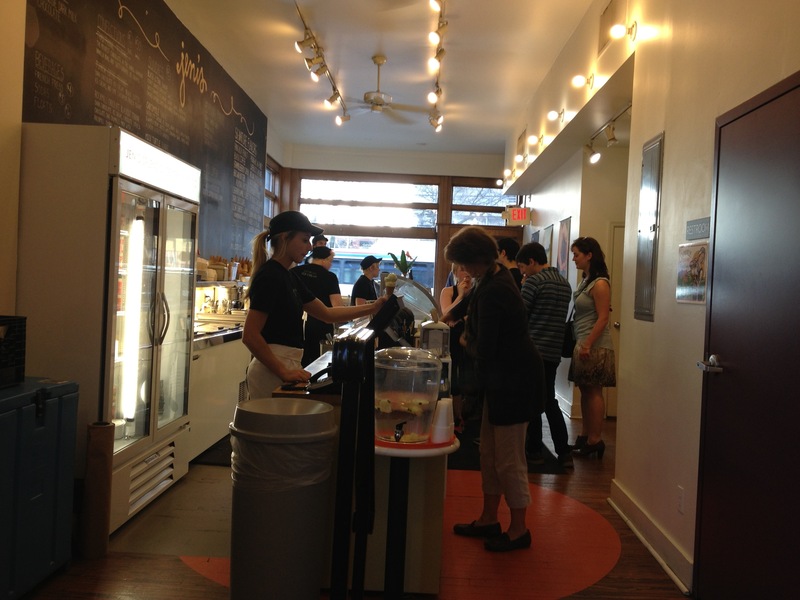 There are other locations outside of Grandview Heights, like the Short North (pictured above), so there’s Jeni’s for you to enjoy wherever you may be. Recommendation: A triple with black coffee, The Buckeye State, and Askinosie Dark Milk Chocolate. For weekend brunch, or breakfast at any other time, there’s really nothing better or more satisfying than Northstar, which also has locations in Clintonville and Easton. Also good are their sweet potatoe hash and basically everything else they serve. Recommendation: Cowboy Breakfast with scrambled eggs and bacon, green tea, and an extra side of bacon if you’re feeling like a champion. I dated a teammate when I was on the rowing team, and our appetites brought us to Cap City all the time. The portions are huge, and they bring out warm buttered rolls before your meal. It’s the freakin’ greatest. Once, when my freshman year boyfriend was graduating from college, his family and friends all went out to Cap City and one of the guys told me that if I ate all of my food plus a slice of Cap City’s famous Seriously Big Chocolate Cake, he’d be very impressed. I nearly puked, but I still couldn’t finish the whole thing. Recommendation: Flatbread appetizer, Romano Crusted Chicken for the main course, and, of course, Seriously Big Chocolate Cake for dessert. Columbus, though small, is rich in things to check out and see at least once in your life. Go to the Ohio Statehouse and at least see the center of government for the state of Ohio. It’s smack in the middle of downtown and really hard to miss, but it’s super cool to walk around in. Outside of the building, they just opened up a Holocaust Memorial, and you can also check out the Ohio Theater, Huntington Building, and downtown home of The Columbus Dispatch, all of which are neighbors. I go to Ohio State, so I don’t really think it’s particularly cool, but Ohio Stadium does tours of the facility that are top notch, and the campus is massive. Stop by the Ohio Union on High Street, the stadium, and the RPAC right next to the stadium, or just spend an hour or two wandering around. It’s academia at it’s finest, if I do say so myself. My hands-down favorite part of Columbus. The river is low right now (they’re dredging it), but usually, this is the most beautiful little stretch of downtown you will find. No, that’s not the real Santa Maria. Check out COSI, the Veteran’s Memorial, and Milestone 229 while you’re down there. There’s a surprising amount to do in Columbus, and the city is small enough that you can almost always do it, if you want to. Our city’s NHL, MLS, and MiLB teams are my favorite part of living here. They don’t get the big-crowd recognition they deserve most of the time, but the fans are fiercely loyal and make every game experience a great one. Be sure to catch a game or two while you’re in town; you’ll be glad you did. Confession: I’ve never been to the zoo, even though I rowed on the reservoir right next to it. But our zoo is one of the best in the country and is consistently wowing people, so you should probably go. This is seriously a book lover’s dream. So many books. I can’t even describe to you. Just look at the pictures.